The U.S.- led military coalition needs to keep military pressure on the Islamic State even after the American withdrawal from Syria. And the U.S. needs to be prepared to still provide $4 billion yearly to Kabul after a troop drawdown in Afghanistan, U.S. Central Command commander Army Gen. Joseph Votel told the Senate Armed Services Committee on Tuesday. Votel told the SASC he had not been consulted nor given any advance warning in December before President Donald Trump announced a pullout from Syria and the possible pullout of half of the 14,000 American service members in Afghanistan. “Certainly we were aware that he had expressed a desire and intent [to leave],” he said. Votel did not elaborate on several questions on the details of the withdrawal, telling the committee he could say more in closed session. “I won’t speculate here now on things we might do,” Votel said. Sen. Roger Wicker (R-Miss.) said the administration needed to remember that “the concerns in this city are bipartisan concerns” when it comes to future American involvement in the Middle East and Afghanistan. Trump’s December announcement led to the resignations of former defense secretary James Mattis and special coordinator on counter-ISIS strategy Brett McGurk. Looking at the situation on the ground in Syria, Votel said the heaviest fighting now against an estimated 1,000 to 1,500 Islamic State or ISIS fighters is concentrated in about a 20-square-mile area along the Euphrates River near the Iraqi border. There, the Syrian Democratic Forces, largely consisting of Kurds, “is moving very deliberately” to clear the heavily urbanized area of the terrorists. Those forces are backed by American aircraft and artillery. He said the parts of Syria and Iraq that had been controlled by the Islamic State are now “99 percent” cleared. With 20,000 to 30,000 fighters still in place and resilient leadership, “we see ISIS operating at a guerrilla level” in both countries in the future. 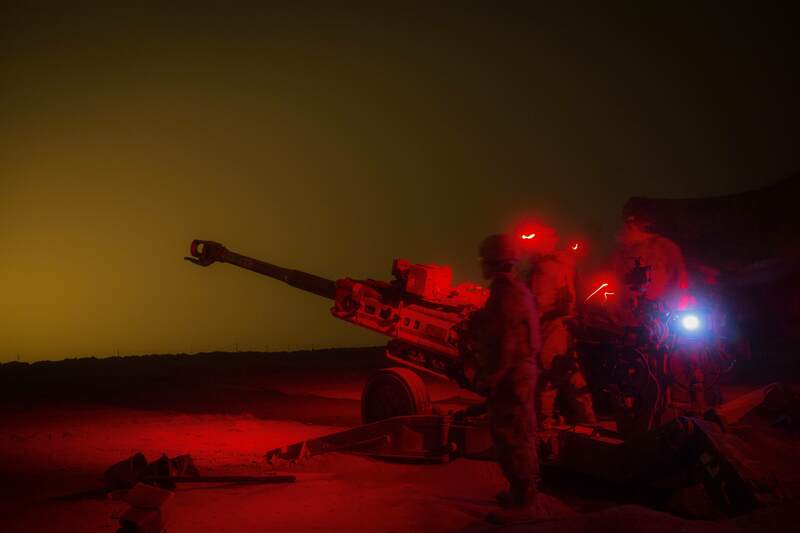 A recent Pentagon Inspector General report warned that, unless pressure was maintained on the Islamic State, the group could re-constitute itself as a force capable of controlling territory and even be strong enough to strike its perceived enemies. Votel stressed that the United States and its coalition partners in Syria are focused on ISIS, not Iran. He added, however, “Iran is the major de-stabilizer in the region,” citing its role in the Yemen civil war, the backing of Hezbollah in Lebanon, military threats against the Sunni Gulf states and Israel, a build-up of its missile forces and aggressive behavior in international waterways. Votel said Russia, Turkey and Iran are all “posturing themselves for what might come” following an American withdrawal of its 2,000 service members. He added that planning in the command includes “the protection of those who have fought valiantly with us and ensuring that they remain safe as our diplomats and United Nations and others pursue a political solution here in Syria.” Turkey considers the Kurds terrorists, and many worry about the Kurds’ safety once U.S. forces leave. On Afghanistan, Votel said the Afghan “government is being consulted” and “kept informed” of talks between Zalmay Khalizad, the special representative from the State Department for Afghanistan, and the Taliban.